Welcome to Moose Mountain Wado-Kai Karate! We are a family-oriented club dedicated to teaching the techniques and principles established by Sensei Masaru Shintani, 10th Dan, and founder of the Shintani Wado-Kai Karate Federation. We have 6 black belts and approximately 60 registered students yearly; ranging from the “Just for Kicks” class (ages 5, 6 & 7) to the student and adult classes. We are located in Carlyle, Saskatchewan, Canada. We hope to see you at a workout soon! Wado Kai Karate is a Japanese Karate style founded in 1939 by Hironori Otsuka. It is an amalgamation of Funakoshi’s Shotokan Karate, jujutsu and kempo. Wado Kai, means the ‘Way of Peace & Harmony”. It is one of the four major styles of Karate in Japan and remains one of the purest form of Karate-do. Kumite (prearranged and free-style sparring) are equally emphasized training foundations. Equally fundamental to Wado is taisabaki, bodyshifting to avoid the full brunt of an attack, this techinique was derived from Japanese swordsmanship. 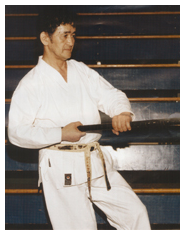 Hanshi Masaru Shintani, 10th Dan (Judan) was the Supreme Instructor of Wado Kai Karate in Canada and is founder of the Shintani Wado Kai Karate Federation (SWKKF). At the time of his death he was the highest ranking Sensei outside of Japan. A direct student of Shihan Otsuka, the founder of Wado Kai, Sensei Shintani devoted over 50 years to the study of Karate. He also held ranks in Judo (Sandan), Aikido (Shodan), and Kendo (Shodan). Sensei Shintani was born February 3, 1927 in Vancouver, British Columbia, the child of Japanese immigrants. His mother was a member of the Matsumoto clan, a respected samurai clan whose history goes back hundreds of years. Like virtually all West Coast Japanese-Canadians during the Second World War, his family was uprooted and moved to the rugged interior of British Columbia for the duration of the war. The Shintani family, mother & six children, was interned in New Denver, an abandoned mining town that was used to house hundreds of Japanese Canadians. While growing up in the camp, he learned the ways of two cultures. On school mornings he attended Canadian classes in English, history, and mathematics. In the afternoon, he studied Japanese language and heritage, along with Kendo and Judo, the standard physical education for all Japanese students. After nine years under Sensei Kitigawa’s direction, Sensei Shintani was graded to sixth dan when Kitigawa returned to Japan. Sensei Shintani himself began to travel to Japan to train in Karate and visit his mother’s family. He met Sensei Otsuka in 1956 at a Karate seminar. Over the next few years, Sensei Shintani competed in and eventually won the championship in the large Japan Karate Federation tournaments. In 1958, Sensei Otsuka approached Sensei Shintani with an invitation to join his organization, Wado Kai. Impressed with the character and integrity of Otsuka, Sensei Shintani respectfully accepted the invitation. During this time, Sensei Shintani’s family moved to Beamsville, near Hamilton, Ontario. Once there, he played semi-pro baseball and tended the family farm and greenhouse to support his family. He began teaching Karate and Judo locally as well as at the Japanese Cultural Center in Hamilton. Sadly enough, being Japanese in North America during the post-war period was to be a target of racism and violence. Sensei Shintani credits his harsh training under Kitigawa and the humility he learned from his mother and Sensei Otsuka with his survival during this time: “I’ve learned a lesson in the war-time camps – under Kitigawa Sensei, I’ve protected my life, and under Otsuka Sensei I’ve preserved it”. In 1979, Sensei Otsuka graded Sensei Shintani to hachidan (8th dan). At the same time Otsuka presented him with a kudan (9th dan) certificate, to be revealed by Shintani after a suitable period of time had passed (he declared his kudan rank in 1995). Also during this time, Sensei Shintani traveled to Japan several times to train with Sensei Otsuka. Sensei Otsuka honored his Canadian disciple by visiting Ontario on a few occasions to visit and teach, the last time being in 1980, only two years prior to his passing. 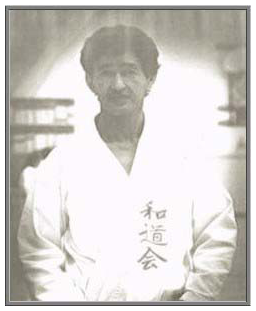 During the 1970’s, Sensei Otsuka appointed Sensei Shintani the Supreme Instructor of Wado Kai in North America. Some time after the death of Sensei Otsuka, Sensei Shintani visited Okinawa to contact the old masters who had trained with Otsuka. Most of these men had passed on except for Sensei Yamashita who shared his knowledge and memories with Sensei Shintani. Sensei Shintani’s devotion to and mastery of Karate is remarkable. Stories of his feats of skill and acts of humility confound those who have not met him. He has constantly refined and improved on the most basic of Karate techniques & concepts to advance the Way of Karate. He refused to allow the vital and dynamic nature of Karate to become stagnant and ritualized, to deteriorate into a stylized dance of impractical techniques and no longer comprise a ‘real’ martial art. He has said that there are no symbolic moves in Kata, every technique must be performed as if ‘real’. In the last years before his death, Sensei Shintani spent much of his time developing Karate and Shindo concepts and traveled to various regions of North America and overseas to conduct seminars in Wado Kai and Shindo. As the leader of a large martial arts organization in North America, he could be a very wealthy man. Instead, Sensei Shintani lived a humble life of quiet modesty, continuing to live by three ideals: Humility, Integrity, and Honor. Those of us in Wado Kai who had the honor of meeting Sensei Shintani recognize what a rare treasure it is to have worked with him in both training and living the Way of Peace and Harmony. Master Hironori Otsuka was born June 1, 1892, in Shimodate, Japan, where his father, Dr. Tokujiro Otsuka, operated a clinic. As a boy he listened to a samurai warrior, his mother’s uncle, tell thrilling stories of samurai exploits. This may well have been where the first seeds were sown that would later be some of the guiding principles and philosophies of Wado karate. Otsuka Sensei began martial arts training at five-years of age under his great uncle Chojiro Ibashi (Shintani & Reid, 1998) and by age thirteen was formally studying shindo yoshinryu jujutsu, a traditional Japanese martial art from which modern judo was derived, under Yokiyoshi Tatsusaburo Nakayama. Whereas most schools at that time stressed throwing or grappling techniques, this school stressed atemi (striking and kicking techniques). His martial arts training continued even when, in 1911, he entered Waseda University to study business administration. It was during this period that master Otsuka began studying atemi-style Toshin-Kenpowhile he continued his studies in shindo yoshinryu. When his father died in 1913 he was forced to quit school and return to Shimodate to work in a bank. By 1921, at the relatively young age of 29, he was awarded the coveted menkyo-kaiden, designating him the successor as master of this style. A year later he began karate training under Gichin Funakoshi, the man who introduced karate to Japan from Okinawa. Otsuka Sensei had heard of Funakoshi’s visit to Japan and journeyed to Tokyo to witness the demonstration. Later, when Funakoshi decided to stay in Japan and teach karate at the Meishojuku Gymnasium, Otsuka Sensei asked to stay and study with him. In 1927 he left the bank at Shimodate,and became a medical specialist treating martial arts injuries in order to devote more time to the martial arts. In 1929 he started the first karate club at Tokyo University, and the next five years would see him establish clubs in many other universities as one of Funakoshi’s most senior students. During this time, Otsuka Sensei also had the opportunity to study with other prominent karate stylists of the time, including Kenwa Mabuni of the shito-ryu style, and Choki Motobu, who was known for his emphasis on kumite and the Naihanchi kata. However, Otsuka Sensei eventually began disagreeing with Master Funakoshi over developmental issues, particularly Otsuka Sensei’s desire to develop free sparring drills, which Funakoshi denounced as an impurity in karate training, with a potential for great injury due to the deadly nature of some karate techniques. By the early 1930’s Otsuka Sensei eventually parted company with Funakoshi, and traveled to Okinawa to learn more deeply of karate from the masters who had instructed Funakoshi. It was his belief that Funakoshi had over-simplified and over-modified several karate techniques and katas in the interests of teaching large groups of beginners. Otsuka Sensei combined knowledge of Funakoshi’s karate with his new knowledge of Okinawan karate, and added several of his own adaptations from Japanese bushido (the way of the warrior) martial arts to form Wado karate. Otsuka Sensei eventually opened his own dojo as the Dai Nippon Karate Shinko club in 1934. According to records published by Shintani & Reid (1998), the name changed to Dai Nippon Karate-do Shinbu-Kai, then to Ko-Shu Wado-Ryu Karate Jutsu, which was subsequently shortened to Wado-Ryu Karate Jutsu, followed finally by Wado Ryu. Otsuka Sensei registered Wado karate in 1940 at Butokukai, Kyoto, and it has become one the four major styles of Japanese karate, the others being: Shotokan, Shito, and Goju. In the same year, Otsuka Sensei organized the All Japanese Karate-do Federation, Wado-Kai, which serves as the worldwide sanctioning body for Wado karate and its affiliates. As early as 1934 he had developed rules and regulations for competitive free sparring to be incorporated into his system, the first karate style to do so. These rules have been wholly or partially adopted by virtually all modern martial arts competitions. In 1966, Otsuka Sensei received the Kun-Go-To, or “The Fifth Order of Merit of the Sacred Treasure” from the Emperor of Japan, who also bestowed upon him the Soko Kyokujitsu-Sho medal for Otsuka Sensei’s contributions to the development and promotion of karate. In 1972, he received the Shodai Karate-do Meijin Judan or “First Generation Karate-do Master of the Tenth Dan” and was designated the head of all martial arts systems within the All Japan Karate-do Federation. Otsuka Sensei passed away on January 29, 1982, after which Wado karate separated into several organizations based upon differences in leadership and teaching concepts.